The last 2 posts have reported specifics on some of the toxic chemicals released into the environment in Missouri in 2017. This post will broaden the view and discuss trends in toxic releases over time. Figure 1. Source: Environmental Protection Agency, 2019b. To some extent it is difficult to follow trends over time because of changes in the TRI program. Figure 1 shows the national trend in chemicals reported to the EPA over time, and it labels the years in which major changes have occurred in the program. The light blue and sandy yellow show the total amount of toxic chemicals reported, the dark blue and orange show the amount disposed of and released. 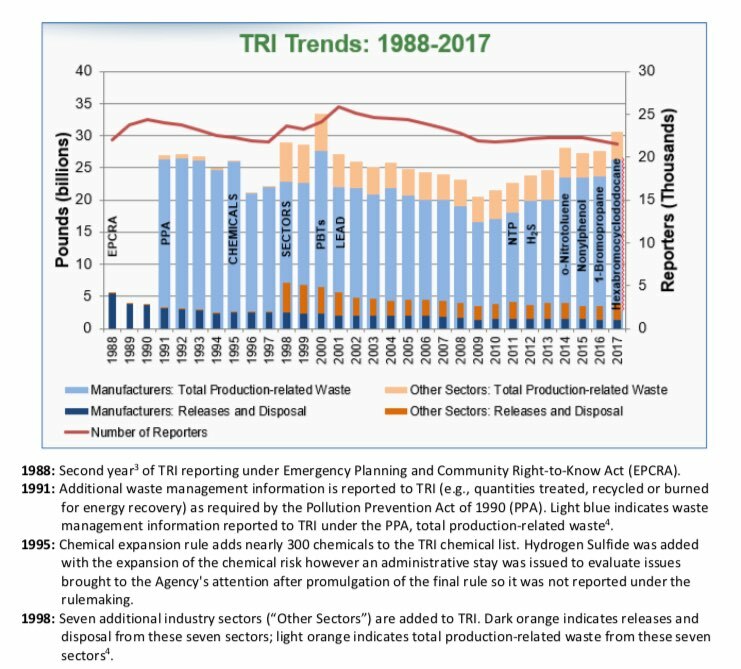 The total amount of toxic chemicals reported to EPA peaked in 2000 and decreased until 2009, the bottom of a recession. Over that period, the amount decreased by more than 40%. Since 2009, however, the amount has increased by about 50%. The chart shows that most toxic chemicals reported to the EPA are used in manufacturing (light blue). It is beyond the scope of this blog to explore why toxic chemicals reported to EPA should drop so significantly, then rebound so significantly. If you know the answer, please comment on this post and let us all know. The increase concerns me. This series of posts started with a review of several catastrophic releases of toxic chemicals that killed people and poisoned the land, in some cases permanently. Preventing the release of toxic chemicals means that no mistakes can ever be made, and that is simply not within human capability. I view toxic chemicals as similar to time bombs. Sooner or later, one will go off. Of course, chemicals reported to the EPA are different from releases: what about releases? 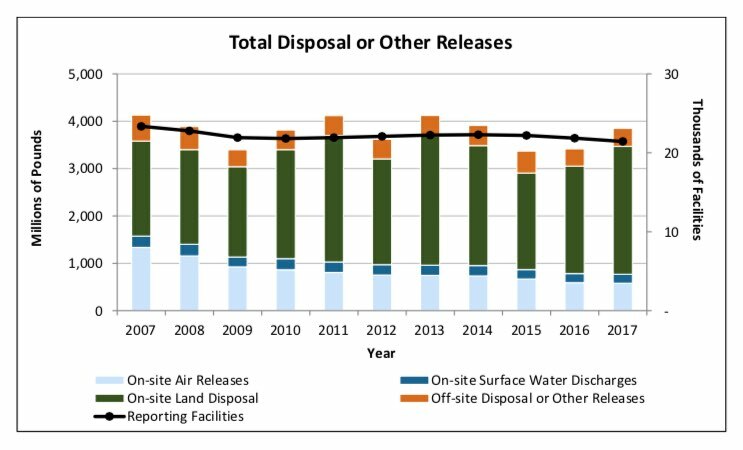 Figure 2 shows on-site toxic releases in Missouri over time. Because on-site releases represent about 93% of toxic releases in Missouri, I will let this chart represent the trend in total releases. You can see that releases peaked in 2004-2005, and have been trending downward since then. In 2017 they were about 47% of those in 2005, slightly less than half. Figure 3. Source: Environmental Protection Agency, 2019b. Figure 3 shows the trend nationwide. The chart I have goes back only to 2007. Since then, the total amount of releases has decreased from just 4.13 billion lb. to 3.85 billion lb., a decrease of 7%. 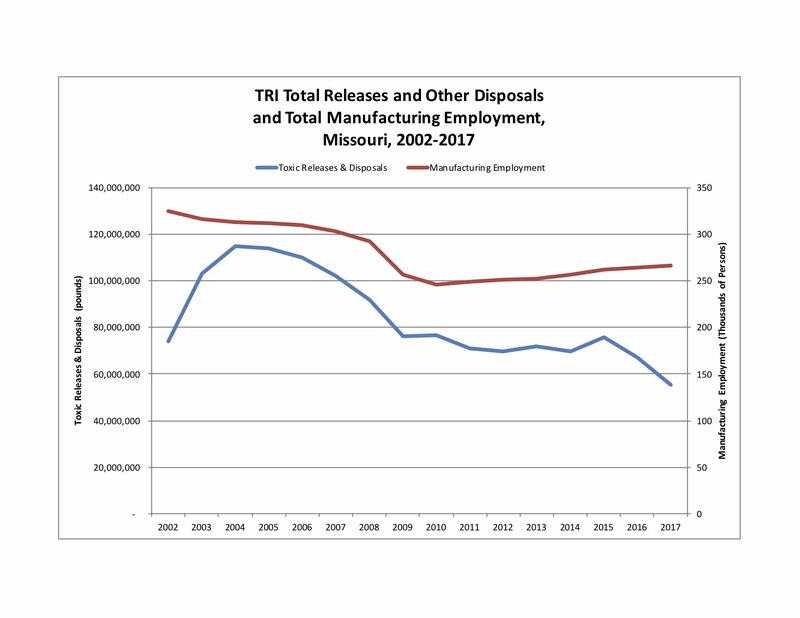 Because Missouri has been losing manufacturing over time, the possibility exists that the decline in toxic releases comes from the decline in manufacturing. To look at this possibility, one would want to plot toxic releases against the amount of manufacturing in the state. But what is “the total amount of manufacturing” in a state? Is it the tonnage of goods produced? The economic value produced? The number of factories, or their total square footage? The number of people employed in manufacturing? I can find statistics for manufacturing employment in Missouri, so I will use it. Figure 4. Data sources: Environmental Protection Agency, 2018; Federal Reserve Bank of St. Louis, 2019. Figure 4 shows the trend over time for toxic releases in Missouri (the blue line, which should be read against the left vertical axis) and manufacturing employment (the red line, which should be read against the right vertical axis). The chart considers toxic releases, not toxics managed. The chart shows that toxic releases and manufacturing employment follow similar trajectories. The correlation between the 2 data series is 0.75, which is fairly high as correlations go. Correlation, of course, proves nothing. There is a wonderful website dedicated to spurious and absurd correlations (For instance, per capita cheese consumption correlates with the number of people who die by becoming tangled in their bedsheets at 0.95. Check out http://www.tylervigen.com/spurious-correlations.) But it seems logical that the decline in toxic releases could be at least partially related to the amount of manufacturing. It would be a wonderful study for some enterprising student. As I noted in the first post in this series, interpreting data in the TRI is complex. The most serious exposures to toxic chemicals probably happen to people who work with them regularly. You can’t assume that releases translate to public exposure. But you probably can infer the inverse: unless there is a release, the public can’t be exposed. These are poisonous chemicals. Lead, the most released chemical in Missouri, persists and accumulates in the environment and in the human body. I’m thankful that toxic releases have declined in Missouri, and I hope they continue to do so. Environmental Protection Agency. 2018. 2017 TRI Factsheet: State – Missouri. Downloaded 3/7/2019 from https://iaspub.epa.gov/triexplorer/tri_factsheet.factsheet_forstate&pstate=MO&pyear=2017&pParent=TRI&pDataSet=TRIQ1pZip=&pCity=&pCounty=&pState=MO&pYear=2013&pDataSet=TRIQ2&pParent=NAT&pPrint=1. Environmental Protection Agency. 2019a. Factors to Consider When Using Toxics Release Inventory Data. Downloaded 3/20/2019 from https://www.epa.gov/sites/production/files/2019-03/documents/factors_to_consider_march_2019.pdf. Environmental Protection Agency. 2019b. Toxic Release Inventory: TRI National Analysis 2017. Downloaded 3/20/2019 from https://www.epa.gov/trinationalanalysis/report-sections-tri-national-analysis. Financial Reserve Bank of St. Louis. FRED Economic Data: Manufacturing Employment in Missouri. FRED is a data portal accessed 3/7/2019 at http://research.stlouisfed.org/fred2/graph/?s[id]=MOMFGN. By mogreenstats in Toxic Chemicals on 2019/03/21 .